Episode two begins where we left off with Episode one of the new season, Jay Garrick’s introduction. We learn about Earth Two, and we get a glimpse of it in some flashbacks; Jay reveals he lost his speed; and we see Season Two’s boogeyman, Zoom. It’s a lot of information packed into the first five minutes. I following five minutes aren’t much better. We are given a better explanation of the multiverse and with all the members of Team Flash there you are able to relate to at least one of them. So are you Professor Stein, explaining the whole thing; Barry and Cisco, the cocky nerds that totally understand it; Iris, maybe a little confused but open-minded; or Joe, hopelessly lost? We find out that while there’s no proof he’s a speedster, but we also know Jay’s not lying. Thank you Caitlyn for your crafty lie detector skills! And finally we meet the spunky, Miss Patty Spivot trying to join Joe’s Metahuman Task Force. During a fire, Barry meets the next Metahuman Zoom sent to kill him and it’s Sand Demon, named previously by Jay (Cisco lets him have it this time). Sand Demon taunts the Flash, before literally slipping through the Flash’s fingers and escapes. Determined for answers, Barry is back with the police looking through the fire’s remains, where he meets Patty for the first time (our second). 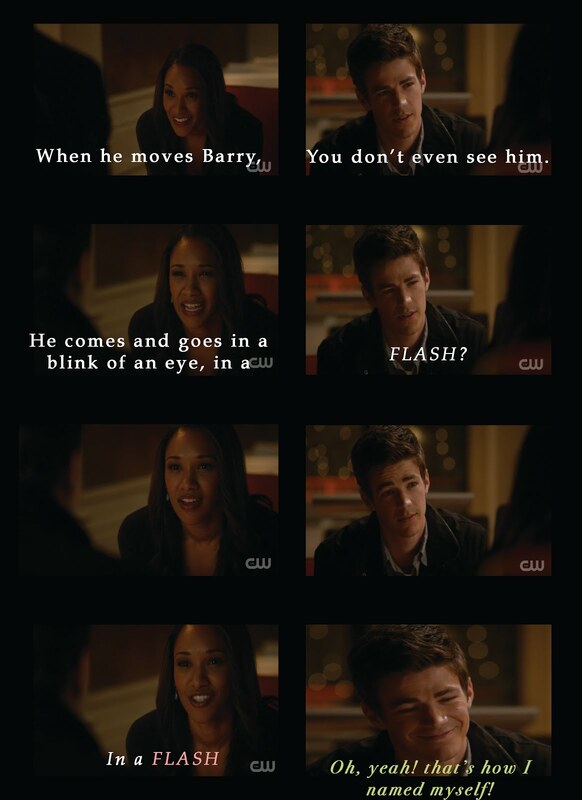 She a Barry Allen fangirl! It’s a cute and awkward first meet and they have instant Chemistry. She’s also still trying to prove herself to Joe, but he’s not budging. Back at Star Labs, Jay is getting frustrated with the tests and Barry not trusting him when he knows more about this Meta than the Team. Stein is going a little crazy trying to figure out the multiverse and Cisco gets another Vibe. Despite the team being back together, things are not going so well. The biggest thing that made me not like this episode is Barry’s mistrust, and while I understand it towards Jay, I hate it towards the team. And that’s when Iris steps in. Last Season Barry was the heart of the show; this Season Iris is constantly reminding him to use his heart. While some people find her useless; to me, currently, Season Two would be a bust without her. Once again in the episode Miss Spivot is out to prove herself, catching the apparent bad guy first. Joe is slowly beginning to accept her. Patty and Barry have a moment in geek fashion while Joe is interrogating Slick, the possible Meta. Unfortunately, Slick in the interrogation room is a doppelgänger, the Earth One non-meta version. The Earth Two Sand Demon version is still on the loose. So here is Question #2… Sand Demon started the Fire Barry had stopped, in the past Slick had started fires too. That’s something both versions have in common. What does that say to the possibility of Zoom’s Earth One doppelgänger to be a speedster as well? Could Zoom be Barry’s Earth Two counterpart? Or Wally West’s? Maybe as odd as it sounds Jay’s Earth One counterpart? I personal think it’s Barry. Shortly after letting Slick go, his Earth Two counterpart arrives and abducts Patty, with her life in danger Barry turns to the only man to have face Sand Demon before. Jay is finally able to step into the mentor role he was made for. While learning a new power, Barry confides in Jay about his trust issues. Just by speaking his problems aloud to the one he’s been directing it about, Barry is slowly starting to move forward. In searching for the location of Sand Demon and Patty, Cisco tries to activate his Vibe willingly, and succeeds. He’s still scared of it though; Wells’ words haunting him and causing him to mistrust his powers for something evil. Mistrust seems to be the theme of the episode. After this whole ordeal and finally hearing her back story, Miss Spivot is officially on the Task Force. Barry apologizes to Jay about how he’s been acting, and is finally ready to listen as Jay talks about his boogeyman, Zoom. Mama West arrives on the set. Cisco and Martin Stein finds out there are 52 breaches in Central City, a nod to the New 52. Finally, we end the episode on Earth One with Martin Stein collapsing, a reprocussion of his separation from Ronnie? And then on Earth Two we meet that version of Harrison Wells, is he good, or bad? One thing I noticed, is Barry never told Jay it was Wells/Thawne that betrayed him and is the reason for his trust issues. I wonder how they both will react to each other when they reveal what role Harrison Wells played in them becoming the Flash of their Worlds. It will be interesting to see.